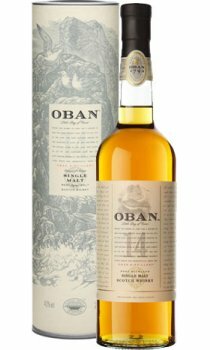 The Oban 14 year old is bottled at 43% ABV and with it's aromas of peat (a whiff of smoke), it has sweet, scented notes of burnt heather, carried through to the slighly oaky and fruity taste, with a slightly creamy finish. Superb at this price point. It's a classic, historical dram from it's distillery in Oban by the Irish Sea.